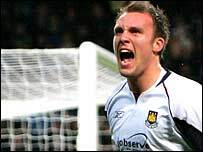 Dean Ashton scored twice to lead West Ham into the semi-finals of the FA Cup at the expense of 10-man Manchester City at Eastlands. Ashton opened his account in the first half when he lashed home past keeper David James from inside the area. City's Sun Jihai saw red after he was deemed to have swung an arm at Matthew Etherington, before Ashton added his second from close range. Kiki Musampa scored a great volley late on, but it was too late to save City. 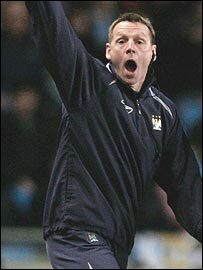 A depleted City, without the likes of Georgios Samaras, Trevor Sinclair, Claudio Reyna, Andy Cole and Antoine Sibierski, created the best opportunities in the first half prior to West Ham's goal. Musampa almost got Stuart Pearce's men off to the perfect start in the first minute, but his low shot from outside the area was palmed away by Shaka Hislop low down to his left. The Dutchman had a better opportunity to open his account for the season later in the half, but he smashed his shot over the bar after the Hammers defence parted like Moses' Red Sea. City's Bradley Wright-Phillips, chosen to play up front with Darius Vassell, also created a half chance but his good run was followed by a tame shot. Pearce's injury problems were made worse midway through the half when defender Stephen Jordan limped off with an ankle injury to be replaced by David Sommeil. While City reorganised, West Ham crept back into the game and four minutes before the break they took the lead with their first clear effort on goal. Ashton exchanged passes with the impressive Etherington before picking up a flick from Nigel Reo-Coker. Momentum took him into the area, where he twisted Sylvain Distin inside out before unleashing a vicious shot past David James. City were close to levelling seconds before the interval, but Sun Jihai's overhead was comfortably cleared off the line by Paul Konchesky. Shortly after the resumption, Sun Jihai's night out at Eastlands came to a premature end when he was adjudged to have swung an arm at Etherington. Referee Howard Webb had no hesitation in showing the China international the red card. Ashton then added his second in bizarre circumstances. Hammers defender Christian Dailly went to ground with an injury near the touchline, but both teams chose to play on instead of kicking the ball out to allow the Scottish player to receive treatment. Musampa was then dispossessed by Reo-Coker who found Yossi Benayoun. The Israel star's ball found the feet of Ashton, who converted from close range. City pressed on despite their two-goal deficit and being a man down, and got some reward when Musampa struck a stunning volley from the edge of the area to set up a nervous last five minutes. But West Ham held on for a place in the last four of the FA Cup. "Obviously it's a really hard place to come and they threw everything at us. Ashton, who added the all-important second after the break, was delighted with his opening effort. "I don't mind using either foot, luckily I got a good strike on it and it went in at the near post," he added. "I was proud of my players after we went down to 10-men. We put them under pressure and West Ham looked nervous when we scored. "We thought we would get more chances on goal but it just didn't happen and my players are devastated. "When the score went to 2-0 in West Ham's favour we were left chasing." Man City: James, Richards, Dunne, Distin, Jordan (Sommeil 24), Jihai, Barton (Ireland 79), Musampa, Riera, Vassell, Wright-Phillips (Croft 73). West Ham: Hislop, Dailly (Scaloni 70), Gabbidon, Collins, Konchesky, Benayoun, Mullins, Reo-Coker (Fletcher 82), Etherington, Ashton (Zamora 89), Harewood. Subs Not Used: Walker, Sheringham.